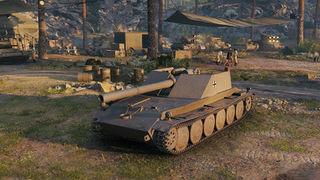 The Rheinmetall-Borsig Waffenträger is the first of the Waffenträger (Support Weapon) class tank destroyers available to the player. It has exceptionally good camouflage value in its tier. Unlike most tank destroyers, its gun is mounted on a turret, making it quite versatile on the battlefield. Its first gun, 128 mm gun, has high penetration, accuracy, and rate of fire, whereas the 15 cm gun sports higher damage at the cost of lower penetration, accuracy, and rate of fire. 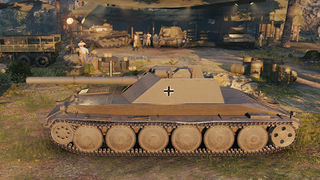 To balance, the Rheinmetall-Borsig has absolutely no armor -- even less than its predecessors -- and is somewhat sluggish like the Sturer Emil. 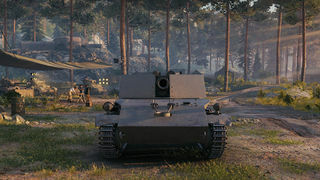 Like its predecessors, it performs best taking a position behind the front line to deliver supporting fire to enemy tanks being fought by teammates up front. This page was last modified on 3 September 2018, at 05:00.